Initially, we must start where it all began…EIRE (Ireland). Here we find the roots of our family with a tribe of Irish Celts known as the Dal Riata. Dal Riata (Dalriada) was the name of the people who came to western Alba(n) (Scotland) from Eire (Ireland) and whom the Romans called Scots (Scotti). According to the Irish Book of Ballymote, the beginning of the 3rd Century around 212-220 B.C.E. is the earliest knowledge we have of them that comes from when they were still in ancient Ireland. At that time there were four main families of Erainn stock, who were considered to be a section of the original inhabitants of Eire. These four families (or septs) were named Muscraige, Corco Duibne, Corco Baiscind, and Dal Riata, that came from three sons of Conaire Mor (a descendant of Prince Fiacha Firmara - from about 180 B.C.) called Cairpre Musc, Cairpre Baschain and Cairpre Riata. These four families of Erainn migrated from Breg in the north to Munster in the south. No reason is given as to why they traveled south, although it is probable that their own family lands could no longer contain them. On arriving in Munster, the Erainn allied themselves with a people known as the Eoganachta, to wage war against another people known as the Erna Mumaim and in doing so they managed to obtain land to live on. At some point later a famine in Munster forced the Dal Riata sept of the Erainn to move back north into the ancient territory of the Ulaid, later to become known as Ulster. One of the four Erainn septs, the Corco Duibne, stayed behind and claimed the Munster land they had left. When the Dal Riata arrived in Ulaid, they allied themselves with the Dal nAraide (also known as the Cruithne, pronounced "Creenie"). A portion of the Dal Riata remained with the Dal nAraide, helping them become more powerful, while Cairpre Riata led the rest of his people across the Irish Sea to the land of the Picts (Scotland). In time, a migration from the Irish kingdom of Dal Riata in northern Ireland took place. Our oral traditions and written history state that this invasion was led by the three sons of Colla Uais Came Erc (d. 502 A.D.), the King of the Irish Dal Riata (and our direct progenitor). These sons were named Fergus, Angus, and Lorne Mac Erc. Under the rulership of Fergus Mor Mac Erc, they consecrated a new branch of the Dal Riata kingdom in the western isles of Scotland, absorbing the stone fortress of Dunadd as their home point. It is said that even to this day, one can observe a wild boar carved in the stone there, a testament to the embryonic Scottish culture at that time. The wild boar, a common symbol in Scottish heraldry, also marks the site where a series of monarchs and leaders stood for coronation. In traditional Celtic style, these new lands were divided among the families of the clan. This action was the start of the Scottish kingdom of Dalriada. These divisions of various land holdings and islands in the Hebrides would become a major seat of rulership and transformation of the heretofore Pictish settlements. Records indicate that Angus Mac Erc claimed the Isles of Jura and Islay as tribal territory, while Lorne Mac Erc absorbed what is now known as Lorn, the seat of Clan MacDougall from which we descend. Over the course of about forty years, the Scots of Dalriada became the keepers of the entire western shores and islands. The whole kingdom was given the title Argyll (Ard Gaidheal). It was during this time that the Stone of Destiny was taken to Scotland by the Irish Gaels that migrated to Argyll, and it became the Coronation Stone of the early Dalriadan kings at Dunstaffnage all the way through history to its last coronation of King John I (de Balliol) after which it was seized and carried away to Westminster Abbey in England by the army of King Edward I "Longshanks" (Plantagenet) of England. Then in the 9th century, the stone is believed to have been transported to Scone, the capital of the Southern Picts. It is here that the Picts and Scots became unified in 844 A.D. under the direction of Kenneth MacAlpin. It is not until the thirteenth century that we glean documentation regarding the various clans that live(d) in the Kingdom of Dalriada. During this era, besides the Dariadan clans, we see a convergence of lordships and tribal powers, all establishing mini-kingdoms (tuathas, or cinels as part of the clann (clan), which literally translates from the Gaelic as "the children"). 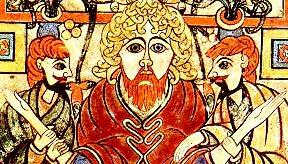 We know little of the events that took place when Cairpre Riata landed with his people except the fact that the Kingship of Dal Riata stayed in Ireland. This remained the case until Fergus mor Mac Erc, King of Dal Riata, arrived with more of his people bringing the kingship with him and in doing so, shifting the emphasis of Dal Riata from Eire (Ireland) to Innse Gall (western Isles) and Alba (Scotland). The Romans called these people "the Scotti". Fergus had two son’s Domangart and the younger son Godfruich (or Godfrey) Mac Fergus who was known as Toshach or Ruler of the Isles and ancestor of the line from which Clan MacDougall sprang. The Chief of Clan MacDougall is called "The Lion of Lorn", while his or her eldest daughter is called "The Maid of Lorn". The present Chief of the MacDougalls, since 1991, is Morag MacDougall. Upon Fergus’ death, his son Domangart became King of Dal Riata, followed by his two sons: Comgall and then Gabran. Gabran’s uncle Conall succeeded him, followed by Gabran’s son Aedan. Up until this time, the Dal Riata were pagan. Although 200 years earlier, Ninian had established, in Galloway, the first church in Scotland in 397 A.D. King Aedan was consecrated on Iona by Colum Cille (St. Columba 521-597), although it was reported that Colum Cille was reluctant to carry out the inauguration. In convention with the King of the northern Ui Niells (O’Neils) (Aed mac Aimrech), King Aedan secured his position that any taxes levied on the Irish Dal Riata belonged to the Scottish Dal Riata and that the Irish Dal Riata fleet should also remain with them, otherwise, from that point the Irish Dal Riata became a separate entity, although the two were still allied. Around 844, Kenneth MacAlpin being a descendant of Aedan mac Gabran King of Dal Riata, was recognized as King of all Scotland (King Kenneth I) through being Pictish on his mother’s side and by carrying the royal line of Gabran on his father Alpin’s side. This pedigree agreed to both the Scots and the Picts. It was at this point that the King’s seat was moved to Scone, the old Pictish palace. At this point, you may be asking yourself "why this ancient history lesson?" The fact of the matter is that our McDowell family history is inextricably linked to the histories of Scotland, Ireland, and the much younger Americas. The early histories of Scotland and Ireland is all about the tribes and families, the possession and dispossession of the territories held by the various cenels (tribe or clan) and families. In contrast with the Highland clans we are a "family" that is one of the great Lowland "houses", and we have comparatively few members who are more likely to be related. The Lowland M(a)cD(d)ow(u)(g)a(e)lls and the Galloways of Atholl share a pride of race of relatively great antiquity and nobility. Our names were actively involved in the inception and development of Scotland, and even of countries overseas. The freedoms of modern mixed societies are, however, obscuring old identities, loosening family ties and causing confusion in manners, morals and customs. In the face of this our family "backbone" is strengthened through the appreciation of the fact that we are expressions of our genetic make-up, which is a legacy from the past and a responsibility for the future. Much of our history has been lost over the centuries through accident and/or destruction. There is still much room for research into this family from the most ancient times to the present day. A difference of opinion even within our own family as to which is the senior branch is well documented. Of these old branches the house of Logan is now extinct, that of Freugh is merged into the Marquessate of Bute and that of Garthland continues tenuously without knowledge of the next related MacDowall stirps (lines). The armorial bearings of these houses were eventually distinguishable, but in earlier times they used in common Azure a Lion rampant Argent gorged with a Crown Or.